Today I sadly learned that the hotel I stayed in in Tahiti this past summer, is closed. This is not Raimiti, the place where I stayed on Fakarava in the Tuomoto Island chain, which was the major part of my vacation. This was the Softel Tahiti Maeva Beach Resort, in French Polynesia’s capital city, Papeete, on the island of Tahiti. Since I had already been to Tahiti in the past and what I wanted to experience was something entirely new to me (a coral atoll in an isolated island chain), Tahiti, itself, was only to be my in and out place, somewhat like many people nowadays treat Honolulu when they take a trip to Hawaii, considering Maui or Kauai or the Big Island to be their main destination. So I stayed in Papeete only the first night in, and then flew out to Fakarava the next morning, and then again on my last night in French Polynesia before flying home to Los Angeles. But the hotel I had chosen for this, which was actually quite close to the Tahiti airport, was surprisingly nice. Here are some pictures of it--what's not to like? Once upon a time, it had been a destination resort itself, a place where honeymooners would come for their dream trip, but the word has long been out that Papeete is a pit and the thing to do is get in and out of Papeete as quickly as possible. While I entirely disagree with this for myself, certainly, or for any serious traveler, probably, it may be most likely true for the thoughtless tourist, the kind who is actually disinterested in history or seeing the business end of a country and only wants to be pampered while lying on the beach. I certainly understand the desire to be pampered, but I also want something more. 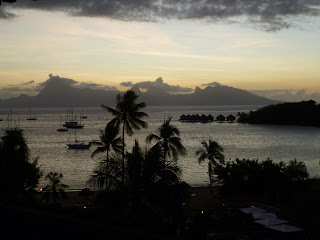 The Sofitel on Tahiti seemed to me to offer a good combination of both and at a way less expensive price than what one can get on Bora Bora or Moorea where really the only economy is tourism. But it wasn’t just the hotel in Papeete that died (it closed at the end of November, 2012), I had already learned on-line that the place that was my destination that summer, Raimiti on the island of Fakarava, had been sold and the man who had built it had planned to remake something like it elsewhere on the atoll to a location closer to the scuba-diving action. This upset regular visitors who enjoyed Raimiti’s utter isolation. So far, nothing seems to have been done, though, and as far as I know, Raimiti is still taking bookings. But basically, both of the places I stayed last summer are either now gone, or soon to be. I have a thick travel binder that had been put together by my maternal grandmother that is a journal of a several-month-long road trip throughout Europe that she took with one of my uncles in his MG. Part of what my grandmother wanted to do was to stay in all the beloved hotels that her parents had stayed in during a similar road trip (in a chauffeur-driven fire engine red Pierce Arrow six-seater with polished brass light fixtures and bumpers), a trip taken a whole generation ago. My great-grandparents travelled the world in an era in which people of that economic class could travel with their car as baggage aboard a ship, so they rode in that Pierce Arrow everywhere in Europe, India, Asia, and Africa. That may seem like ancient and almost unthinkable times to the people living today, and yet all those hotels, both grand and small, were still in business and my grandmother and uncle were able to stay in them all. Cruising by ship for my grandmother was certainly different than it is now. For one thing, the ships were much smaller, they were not monstrous floating Las Vegas hotels like they are now. But the point I want to bring up here is that they stayed around for a very long time. My grandmother developed a love for certain ships that she would travel on again and again over several decades. There was a ship, the Sagafjord, that stayed in port in San Francisco for two days and our family got to visit her aboard that ship and be her guest a dinner in the dining room. That would have been sometime in the 1960s. That was the first cruise ship I had ever been on and I yearned for the day when I would someday be able to afford a similar cruise. However, cruising by ship was all but decimated by jet airline travel, so the cruise line that owned the Sagafjord (along with the Vistafjord that my grandmother sailed, and several other ships), Norwegian American Lines went out business. However, Carnival most likely gets the credit for reinventing cruising several decades later, offering short duration destination party cruises for middle class travelers. Cruises of my grandmother’s type would sail around the world, or last several months. Carnival cruises might be as short as three days, or perhaps as long as seven, sailing, let’s say, from Miami to the Bahamas and back again. Now cruise travel was affordable for me, and I booked passage on the Norwegian Cruise Line ship, the Norwegian Sea. Little did I know that I sailed that ship on its last season; it was already considered to be a ship too small for “today’s” ship travel (it was NCL’s smallest ship), so had been moved to an “inferior” port (Houston, Texas) and after the summer travel season was transferred to its new owner, a local cruise line operating out of Asia. However, for me, the cruise was marvelous, Houston, Cozumel, Roatan Island in Honduras, Belize, Cancun, and some days at sea at the beginning and end. I saw nothing wrong with it at all. Interestingly, I actually could have sailed on the ship, the Sagafjord, that my grandmother had loved, although now owned by a different company, and entirely refurbished and sailing under a new name, the Vista Rose. I had assumed that it was long gone, crashed up onto a beach in Bangladesh to be cut up for scrap, but I remembered its unique shape and happened to see it from the water at the Port of Los Angeles when I was taking a harbor tour cruise (imagine the coincidence of events!). I took down its new name, did some Internet research when I got back home, and lo and behold, it absolutely was the former Sagafjord, now operating very specialized boutique trips out of England, but outrageously expensive, about seven times the cost of my Norwegian Cruise Line cruise. But mostly these huge big ships don't seem to last very long, at least, not with the same cruise line and in the same market. The year before I took my cruise on the Norwegian Sea, which was already on its last legs as far as NCL was concerned, my on-line friend Jeff (whose Blogger blog, My Piece of the Beach, I follow) went on a cruise to Nova Scotia with his family on one of Carnival's newest, hugest, and most spectacular "new ships", the Triumph, that I was very excited to see on my cruise in Cozumel. But guess what, it is that very same ship that has been in the news lately, recently suffering an engine fire and now all hell has broken loose aboard with toilets being unable to be flushed and people savagely fighting for food, sleeping in tents on deck, and so on (so says the press). I don't know if Carnival plans to retire this ship, sell it to somebody else, change its name, or what, but cruise ship passengers will probably be reluctant to sail on this particular ship if they know it was the one with this history. When did I develop a nostalgia for particular hotels? I think the oldest memory I have of sleeping in a place other than in my own house or at the house of either of my grandparents was when I was about five or six years old. From the way I remember it, the family had taken a trip to the beach at Cape Cod from North Carolina that summer. I never wondered why my parents had chosen to do that, but in thinking about it in preparation for writing this, I realized that normally there would be absolutely no reason for my parents to make a beach trip to Massachusetts. We did take trips to the beach when I was younger, I have seen the pictures, although I have no memory of it at all. We always went, quite reasonably, to beaches in our own state, such as Wrightsville Beach, and to Myrtle Beach in South Carolina; no possible reason to go all the way north to Massachusetts. Our only connection to Massachusetts was that my father went to M.I.T. there, got his master’s degree in Nuclear Engineering, which he did when I was around six or seven years old. So I am making the strong assumption that Dad needed to go up to Massachusetts to check out the program at M.I.T., maybe take some entrance exams or something, so they decided to bring the whole family and add in a beach trip to Cape Cod. If Dad was going to be going to M.I.T., we would be living in the Brookline area, so I am sure Mom wanted to check it all out, too. The beach at Cape Cod fascinated me. Unlike the North Carolina and South Carolina beaches that I don’t remember seeing as a child, but I know that I did (and I have seen them as an adult, so I know what they are like) that are simply flat expanses of sand along the length of the ocean, Cape Cod had undulating sand dunes punctuated with tall wild oats and lined with crooked, sand-blown slat fences (or wind breaks). There was a complex of wooden slat walkways coming from the front doors of the cottages or apartments where we were staying, curving along and going up and over the various sand dunes until depositing you down onto the smooth, flat part of the beach. I have never seen a road, path, railway track, or trail that I didn’t want to follow, and these wooden walkways going up and over the sand dunes fascinated me no end. To me, those curious and intriguing walkways were the best thing of all, although I also enjoyed playing in the sand dunes themselves. I do remember the ocean water, also, it was dark green and felt cold. Everything was windblown and the sky was gray and cloudy. I had no negative judgment of any of this, but was simply absorbing the experience of it. I am pretty sure my parents had expected to stay there a week, or so, because what unit they rented had a fully stocked kitchen and my mother cooked us dinner that night. I was full of excitement over all of the experience and as I had not yet had my fill of exploring the place, I was chattering on about going to see where all those wooden walkways went the next day. That’s when my parents dropped the bomb on me—we were leaving the next morning. I am sure I must have whined, “Why?”, because they explained that the weather was terrible, my mother didn’t like it, and we would end up having a much better time going to a beach back home, instead. I was devastated. And I clearly remember feeling that feeling of childhood helplessness in the face of powerful parents who were going to do whatever they wanted to do and whatever hopes and dreams you had were utterly irrelevant. I think I struggled with that particular complex my whole childhood (maybe every child does), which had made me into an adult who pretty much always does (within reason) whatever I want to do, and no one can deny me it. (Whenever anyone goes on about how wonderful "blissful" childhood was when you were "free" and "careless", I always think, yeah, and you were also powerless, so adulthood is better. And whatever we ended up doing after we left Cape Cod, I have absolutely no memory of it, but I can still hear the wind whipping against the screen door of the unit in Cape Cod and feel the dried salt on my shoulders while I ate my dinner in unhappy, terribly disappointed silence. Other than our aborted trip to Cape Cod, I don’t remember a thing about motels (even though we had moved around a bit with my father going back to college and all, which meant we must have had some temporary lodging during those changes) until our family was moving across country to California when I was eight. And even then I don’t remember any of it until we joined with Route 66 in Oklahoma, which was halfway across the country. Whether it was the perceptible climate shift (somewhere around the middle of Oklahoma the humid air disappears and dryness takes over, and on every one of my twenty or so road trips across country that I have taken, the skin on my body feels the exact moment of that change), or there just was something truly magical about Route 66 (for which there is such nostalgia among a certain generation, today), I don’t know, but I sure feel it always. This was a big deal, though, our family moving to California. After my father got his masters degree from M.I.T., he and my mother had taken a road trip across the U.S. with my uncle (the same one that my grandmother took that European sports car trip with), with Dad job-hunting all the way. He ended up getting thirty-five job offers(!) by the time he was back home, so he took the best one, which was to be an aerospace engineer with Lockheed. Lockheed was paying to move the family out to California from North Carolina. Mom and Dad bought a convertible to celebrate the occasion (a 1956 coral and white Mercury Montclair)…they were going to be Californians, now! In Palo Alto, they bought an Eichler house in a housing development of Eichler houses (my "travelling" grandmother said on her visit that she couldn't even recognize that that house was a house), filled with other aerospace engineers, Stanford University scientists, Hewlett-Packard technologists, and Stanford Research Institute researchers. All that is now “Silicone Valley”, but in the 50s and 60s it was the space frontier, and so I always felt that that region was “technologically futuristic” in character. If my parents stayed in motels back east during our moves prior to California, I am sure they always arrived way after dark when we kids were already asleep in the car. We’d see nothing of these places except maybe a glimpse of white sheet as we were carefully laid down on the beds, and maybe the sense of a clean bathroom with green tile, a toilet with a paper ribbon across it, and a drinking glass wrapped in a paper envelope. Fortunately on Route 66, my parents always stopped before dinner; they were probably tired of driving the hot road. This was before there was air conditioning in a car…and until their dying days, my parents never fully understood the luxury of having an air conditioner in the car, which, while available for me when I bought my first car in 1970, was a high-cost add-on. In later years, my father would argue with car salesman about the air conditioning, angry when it became standard and he had to pay for it by default. But back in 1956, you needed water to cool off. You’d stop hourly by the side of the road to get a drink of water and maybe pour some of it onto a handkerchief to wipe your face. Having a bucket of ice in our motel room was so wonderful! But, best of all, was the motel swimming pool. Not every motel had a pool, but my parents always attempted to stay in a motel that had one, if possible. How great it was to find the motel with the cowboy and a “vacancy” sign, unload the car and then the whole family would put on their bathing suits and run out to the pool and jump in! I wish that a swimming pool still felt that magical…I think they still do to every kid, who can find endless joy in running around and jumping in and out of a pool or diving from a diving board or playing all the made-up games that kids can continue to create. But out there as evening began to fall in Texas or New Mexico or Arizona, there could hardly ever be imagined such a delight as a swimming pool. Then we’d have dinner in a restaurant at the motel, if they had one, or perhaps in a somewhat “fancy” restaurant on a main street in a small western town, the kind where you could always park on the street in front, parallel parking, or, if a more crowded town, they would have diagonal street parking. Who remembers diagonal street parking? I don’t know how long it has been since I have seen that. It seems that every one of those downtown restaurants had “cattle” themes…it was as if every meal was on the set of the movie, Giant, still one of my favorite movies of all time. The walls were decorated with gigantic and carefully rendered oil paintings of bulls or steers, and the menus were forever decorated with branding irons. But still, best of all, was going back to the motel for bed. There is a particular wonderful cool and clean smell of every single motel, even those of today that are no larger than two stories, a smell that I guess comes from the air conditioner or perhaps the laundry detergent that they use for washing the sheets, or maybe some other kind of cleaning fluid. I honestly have no idea what it is, and hotels or large, multi-story motels do not have that smell, it is only the smaller motels. But, whatever it is, I want to have that smell, I want to have it in my own house, or in the bedroom, at least. To me, it is a sure sign of rest and comfort after a long, but exciting day, and a promise that tomorrow will be more of the same. I have never heard anyone say it, but I wonder if all that nostalgia for Route 66 isn’t really for the highway itself, but for the motels that were on it? It wasn’t until I was about ten that I finally saw the inside of a hotel. We never stayed in a hotel while travelling (motels, yes, hotels, no). But when both sets of grandparents would come to California from North Carolina, they would stay in the President Hotel on University Avenue in downtown Palo Alto. They stayed in Palo Alto because that’s where we lived, but even when we moved to Atherton, they continued to stay at the President Hotel, which they had come to love. So my parents would drive there to pick them up, but they would stay parked on the street while we kids got to ride up the elevator to whatever floor our grandparents were on and knock on their room door. They would let us in to see the room and look out the window. It was fun to look out from somewhere high like that and see the street and the people below. So a hotel, to me, felt like something very special, and I liked that idea of being in a room high up in a building. I also liked that closed-in, secure feeling that a hotel like that has. You’re cozy up in the clouds, practically. That hotel, by the way, is now an apartment building. I finally got to stay in a hotel, myself, when I was a freshman in high school. I joined a state-wide high school club, The Junior Statesmen of America, where we seriously played at being congressmen. Twice a school year, there would be a state-wide convention that would take place in a hotel or resort, where the order of the day was submitting bills that we would write and sponsor, giving speeches arguing for or against their passage, and having them voted on. There were also parties, and dinners, and small meetings, and lectures from very big, famous people (I remember a lecture from California’s Governor Pat Brown at one convention—he was the father of our current governor, Jerry Brown--and the renowned linguist, who later became a senator, S.I. Hayakawa, at another one). I made friends with people from all over the state of California due to this club. Fortunately, my parents had allowed me to go to all eight state conventions (they paid for them!) and I still remember the hotels where each of those conventions were held. All these hotels were really something, as you could see if you click on the links. My freshman year, Fall State was at the Sheraton Palace Hotel in San Francisco. That has the most spectacular dining room I have ever seen (look at the pictures!). That hotel gave me a particular feeling of love for the whole romantic atmosphere of the city of San Francisco. Spring State was at a beachside resort in Long Beach, the name of which I have forgotten, because it went out of business so very long ago. But I don’t think there is anything in Long Beach today like it. My sophomore year, Fall State was at The Hotel Senator in Sacramento. It was right across the street from the State Capitol building, and when we had Fall State there, we were able to have legislative meetings in the actual assembly chamber at the State Capital, itself. That was pretty awesome. However, that is another one of the hotels (the subject of this blog) that went out of business, much to the chagrin of several people who remember it with honor. We were lucky enough to have Fall State there at The Hotel Senator and use the State Capital building for the Fall States of my junior and senior years, as well, so I stayed there three years in a row. Spring State was at the beachside resort hotel, The Miramar, that is yet another hotel that has gone out of business, but there are those who hope that it will be restored (but this has been going on for years, so I am doubtful. Spring State my junior year was at the grand and famous El Mirador Hotel in Palm Springs. Guess what its fate is—it is now part of a hospital. Spring State my senior year was at my favorite hotel of all. It has gone through going out of business, being turned into apartments, being turned into a dormitory for the University of California at Riverside (unimaginable), and then, fortunately, back to being a spectacular hotel. See if you wouldn't like staying here! It’s one of my favorite places in the whole world and I have been saying for years that “someday”, I want to stay there again (while it is still a hotel!) And yet, that “someday” never seems to come. What with the way that fantastic hotels suddenly go out of business, and especially after learning today about the Sofitel Tahiti Maeva Beach Resort going out of business before I had a chance to go back there, I think I better make reservations in this hotel for a few days this upcoming spring break or I may be kicking myself for the rest of my life. By the way, remember that I said that I had been to Tahiti before? When we were there in the mid-80s, we stayed in a quite unusual hotel way over on the other side of the island where the "Tahiti-iti", the small little piece of the island is attached to the "Tahiti-nui", the major, big piece of the island. This hotel was built up into the steep hillside, each room, a suite with a patio in front, except that all three walls were underground. When you looked up at the hotel from below it looked "normal", that is, you would see the glass-faces of each of the suites. However, if you looked at the hotel from up above, all you would see would be a grass hill. When you sat on your patio in front of your suite and looked out over the ocean, you would feel like you were the only ones there, sitting on your own hill with nothing below you but lush grass and the ocean. This hotel is now so "disappeared" that I can't even find anything about its history on the Internet. So, I have been to Tahiti twice and both hotels I have stayed in there are out of business. One summer in the early 70s, a girlfriend of mine gave me a free ticket to Hawaii (she worked for a wholesale travel booking company and received more free tickets to Hawaii than she could ever use). I was there for ten days, staying in Honolulu in the house of a friend of mine except for three days in the middle when I took a side trip to Kauai. On Kauai, I stayed in a cheap motel in downtown Lihue, but I drove by the famous resort, Coco Palms, and vowed that someday I would go back to Kauai and stay in that hotel. About five years ago, I went to Kauai, and for sure was going to stay at the Coco Palms, but by now you can guess that that was not possible. Why? Because the hotel was destroyed by Hurricane Iniki. So, of course, you can imagine that it, too, is undergoing that whole campaign to restore it. Will it be restored? I hate to say that by now I think it very unlikely. That just doesn't seem to be how things are done in the tourist industry. Just tear 'em up and build condos. I ended up staying in a quite reasonably-priced hotel (motel is more like it), The Kauai Sands on the beach only a little bit over from the Coco Palms (which, itself, was not actually on the beach, but across the highway from it…and there still is nothing on the beach straight across from the Coco Palms). I liked staying there, it was close to everything, and was completely satisfactory to me. However, it has been in the process of being sold for several years, turned into time shares, or is in danger of being torn down, so that I am surprised to see that it is still there, but barely, just barely. Hanging by a thread. It wasn’t until about five years ago that I started to take actual vacation trips. I guess that’s because I finally felt settled in a long-term job. Almost all of my other trips as an adult were based on me moving somewhere or having a trip between school semesters. I moved one hell of a lot in my life. The year before my trip to Kauai described above, I took a trip to Miami Beach and Key West, basically my first real vacation trip. I had long wanted to experience that highway out to Key West from Miami, going from Florida Key to Florida Key as if on stepping stones across the ocean. And, of course, I figured that Key West would have spectacular white sand and tropical blue waters. Miami Beach I planned to use as an arrival and departure place; I had been there before, so Key West was my main destination. However, I was disappointed by the highway to Key West…it really didn’t feel much different than, say, driving from Tallahassee to Mobile, Alabama. And the beaches were, in a word, awful. The only real “beach” at all was in a facility owned by the Navy. The resort where I stayed, which was right on the shore near the Southernmost point, provided a long pier out over to water with a stairway down for gaining access. Not my idea of how to get into an ocean, but there is too wide of a strip of sharp and creepy-to-walk-on sea grass along the Key West shoreline to enjoy access from the land. I did enjoy the town of Key West, eating and touring, and the resort where I stayed had a nice swimming pool. Other than that…. Where I was staying was called the Atlantic Shores Resort and it had a few innovative features, such as the place was clothing optional and they had weekly dance parties open to the public, and outdoor movie nights in their parking lot. I honestly hadn’t chosen this hotel for its clothing optional feature…I had already figured out that my own clothing optional days were over. I chose it because the price was right (in an otherwise rather expensive city) and the location was excellent, and also I rather liked the kind of “funky” atmosphere I expected it to have. Where I stayed in Miami Beach (“North Miami Beach”, although it is also called “Sunny Isles”), was a simple Days Inn, pretty old and small. As this was meant to be my “first night in, last night out” place to stay, I wasn’t demanding much. However, it did have a feature that really like, it was right on the beach, whereas all the fashionable “Art Deco” hotels in South Beach are across the street from a park that fronts the beach. I felt that I had a better deal with that inexpensive Days Inn on the sand, and upon seeing it, I liked it a lot. My room on the second floor also had a balcony, facing the ocean, no less, something that (room with a balcony, ocean view, hotel on the beach side of the road) would be (for me) an unaffordable luxury in Southern California. So, being disappointed with Key West, I decided to check out of the Atlantic Shores Resort and go back to the Days Inn in Miami Beach. I even got the same room back! And I was quite happy with Miami Beach and felt that I had found a great find with that Days Inn, there, and figured I would go back there several times. However, going back there was not to be…Donald Trump bought up that Days Inn and the several hotels on either side of it, tore them all down and built three immense condominium towers (see, I told you it was a great location!). Actually, in looking for an on-line link to a photo of those towers that replaced the small hotels on that strip, I saw that the entire Sunny Isles strip has been taken over by immense and spectacular condominium towers filled with multi-million dollar condominiums. So my little Days Inn motel didn’t stand a chance. Meanwhile, the Atlantic Shores Resort in Key West has also been razed and the property rebuilt with something quite chichi, and expensive. I guess that’s the way of it. But it was weird to have both of the places where I stayed on that trip disappear. Do I now have the feeling that if I stay in a hotel (or go on a ship), that will be the kiss of death of it? I wouldn’t mind so except some of these were places that I wanted to go back to, or stay in for the first time. But that’s life, I guess…constant change. Whatever happened to things being like my grandmother’s day when she could stay in all the same places her parents had stayed in and loved? I can’t even do that with my own hotels half a month later!